HANKSVILLE, Utah — As I ascended the stairs to the second floor of Utah's Mars Desert Research Station, something struck me as strange: the lights were off and the crew was quiet at what was usually a busy time — 5 p.m.
As I reached the top of the combination staircase/ladder, that's when I spotted it: a chocolate-iced birthday cake on the table, lit up with candles. Two large packets of dark chocolate sat on the table. The other five people of Crew 133 at the Mars Desert Research Station had kept the arrangements secret from me, even sending me out to the greenhouse under other pretenses for 45 minutes to get me out of the kitchen. A screenshot from a video shows journalist Elizabeth Howell blowing out the candles on her birthday cake at Utah's Mars Desert Research Station in January 2014. Like any space crew, Crew 133 — the University of North Dakota-led crew that I am a part of — doesn't have time to stop long to mark special occasions. We only have a two-week mission, meaning our days are packed full with geology, engineering, astronomy and medical experiments. For journalist Elizabeth Howell's birthday, her family sent along a few small presents. My crewmates, however, did the most to help me celebrate a thirtysomething birthday despite our busy schedule. One person asked about the messages I've received from the family and friends I miss. I was invited to choose the movie for that night ("Close Encounters of the Third Kind"). Also, when my computer refused to connect to the Internet earlier in the day, a crew member took extra time to get it fixed. "You can't be out of touch on your birthday," he joked. Otherwise, though, it was a normal day — if you can call a day simulating Red Planet exploration normal in any sense. Four crewmembers went on a simulated "Marswalk" that morning. Later that night, we experienced clear skies for the first time in a week, allowing folks to go outside and glimpse Jupiter and its moons in the Mars Society's telescope. When my family sent messages to me, it was not so much about how they miss me, but how proud they are of my work. I just hope to do everybody right by my responsibilities to the crew. 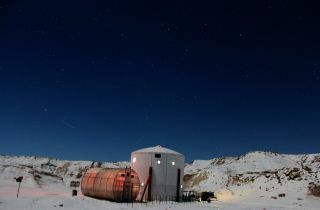 Elizabeth Howell is performing a two-week simulation at the Mars Society's Mars Desert Research Station from Jan. 4 to 19. Have a burning question about the mission or a picture you really would like to see from the site? E-mail contact@elizabethhowell.ca for the chance to get your question answered in a future story.